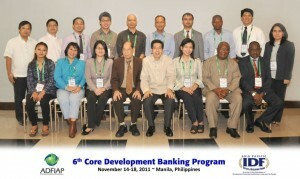 ADFIAP’s Institute of Development Finance (IDF) has granted the credential “Associate in Development Banking” to fifteen (15) DFI officers who have successfully completed the 6th edition of its Core Development (CoreDev) Banking Program, held on November 14-18, 2011 in Manila, Philippines. This brings to a total of 100 officers from DFIs worldwide who now have completed this credentialing program which started in 2004. The fourteen successful participants were from Bhutan, Malaysia, Nigeria, Vanuatu, and the Philippines. CoreDev is Level 1 of the two-level ADFIAP Career Credentialing Program (ACCP). 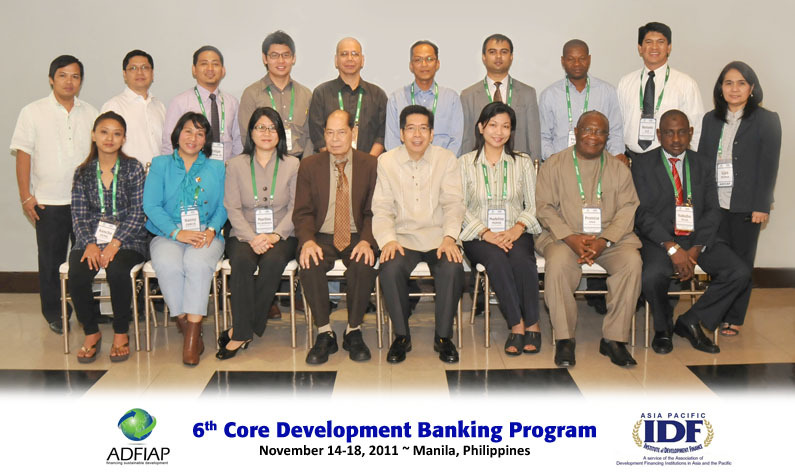 Level II is the Development Bank Management (DevMan) Program. ACCP is a process of accrediting and recognizing the professional competence of a development banker and is open to professional staff of development banks and financial institutions engaged in the financing of development, members of ADFIAP, as well as any other development finance organization or association with which ADFIAP has a working relationship. CoreDev consists of two (2) modules. The first module, “Principles and Practices of Development Banking”, provides an understanding on economic development models and theories and the role and evolution of development banks. It also provides pertinent knowledge and skills on the operational policies and workings of a development bank as well as the nature of development projects, the role of the development bank in project management, project design and appraisal, and in the technical and financial aspects of project design. The second module, “Design and Appraisal of Development Projects”, provides for an appreciation of the different aspects of project investment design and how the financial and economic aspects fit into the overall investment plan submitted by a loan client. In addition, the module includes appraisal techniques that distinguish between purely private-oriented investments and development projects. Aside from lectures and workshops, the participants made an institutional visit to the Land Bank of the Philippines, one of the top-tier DFI in the country, where they were briefed on how the Bank assess projects that are submitted for loan request, its existing credit and equity facilities, its risk management programs and other current development initiatives.